For a little over 8 years, I've been living in Florida. Stephen and I took a risk by leaving New York, in order to start our careers...and ultimately our life together. As exciting as all of that was, it was never easy to just leave....and I'm saying this for a lot of reasons. For me, a big reason was my little brother. We were ALWAYS close, even while growing up with just three years between us. To this day I consider him my best friend in the whole wide world, and literally I think the world of him. Of course we don't talk as much as we would like but it's understandable as we are both incredibly busy people in two totally different ways. We see each other but not as often as we would like. It also seems that when we do see each other it is for either holidays or special events. Don't get me wrong, it's nice to see him under those circumstances but I always figured it would be nice to spend time with him "just because". Pete (that's his name, FYI) is a musician and all summer long I was hoping to plan a trip to see one of his shows. There always seemed to be a reason to put it off until the next one...legitimate reasons too....the girls, timing, taking off of work, flight expenses....life, ya know. After returning back to work after summer vacation and talking to a co-worker and friend of mine I decided life is just WAY too short, and I was so over putting the trip off. My sweet hubs understood and just one week out - I "spontaneously-ish" booked a trip for a visit to see Pete in Boston at one of his shows. BEST decision ever! It was a blast! My cousin Jen went too, and we had the best time...mostly eating, and drinking, and being silly like we've always been. In those moments it's like time is standing still...we don't seem like grown ups, it's like we're kids again. 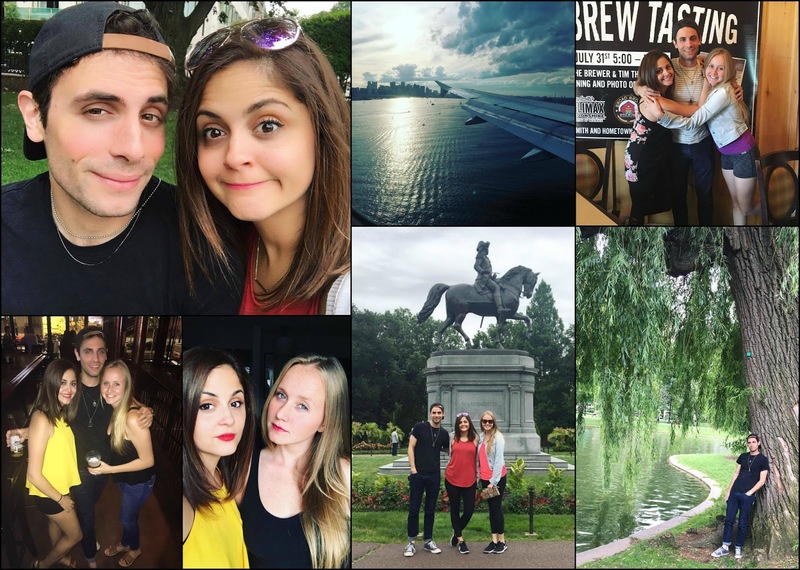 Here are some of the highlights from my very quick but wonderfully jam-packed trip to Boston.... I definitely hope to be able to spend more quality time with him JUST like this, JUST like old times. We wandered the city, and did what our family does best....eat! When we aren't eating, we are usually planning out our next meal. This is normal for most families, right?! Pete's show was incredible, the crowd was insane, I don't have any pics because I was a very proud sister....and I Facebook-lived, almost the entire show for my parents. Good times, I hope it isn't long before I get to experience another bro-sis trip, even if it's something a little more local. Love you Bro!! I hope you girls have a bond as strong with one another as I do with your very cool, Uncle Peter. There's nothing like it! I too, have an amazing bond with my little brother. I totally felt every word you said! ( especially the part where most of our time together is planning our next meal, lol) I am so happy for you that you had that time...it's so important...and most importantly sharing your stories so that you impart some human kindness into the world! Love ya Steph. See you soon!